Headship in a family has to do with structure, function and unity. God has ordained that the husband assume the role of head of the home. This is not because men are more intelligent than women, or more capable of making decisions, or superior in any way. In any equal partnership one of the two must have a casting vote and one must be responsible to a higher authority for the wellbeing of the partnership. If both partners have exactly the same authority and accountability, then any major difference of opinion has the potential of bringing the partnership to a standstill and of damaging relationships. 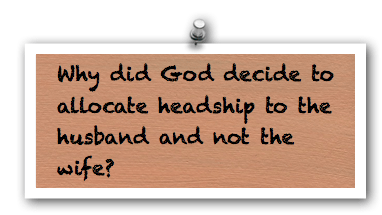 Why did God decide to allocate headship to the husband and not the wife? In other words, why is it gender specific? I don’t really know, but the Bible is pretty clear on this issue. We know that there are physical, emotional and psychological differences between the genders, so why should there not be spiritual differences as well? Being the head of the home does not mean that the man is superior to the woman. It simply means that he has a different functionality and responsibility within the marriage partnership. Verse 25 of the Ephesians text goes on to say, ‘Husbands, love your wives, just as Christ loved the church and gave himself up for her…’ So a husband is responsible for placing his wife’s wellbeing above his own self-interest. The essence of headship is sacrificial service. This is a far cry from the male chauvinism that so many people associate with family headship. If you are a married man, do you accept the responsibility of headship? How do you display this role of sacrificial service? Thanks for this Chris. Colin did mention this in the marriage course. I will remove the shackles from my wife right away.